But a quick search reveals that St. Louis County has no record of anyone with the last name of Day dying in St. Louis County in 1937, and the only birth record for a “Day” born in Duluth in 1911 was for September 5; the record provided no first name for the child, just mother’s maiden name, Clark. Growing up about a half a block from this [then unmarked] ‘tombstone’ the neighborhood kids, and maybe adults, wondered why that was there. There was no explanation for it. It was just there. 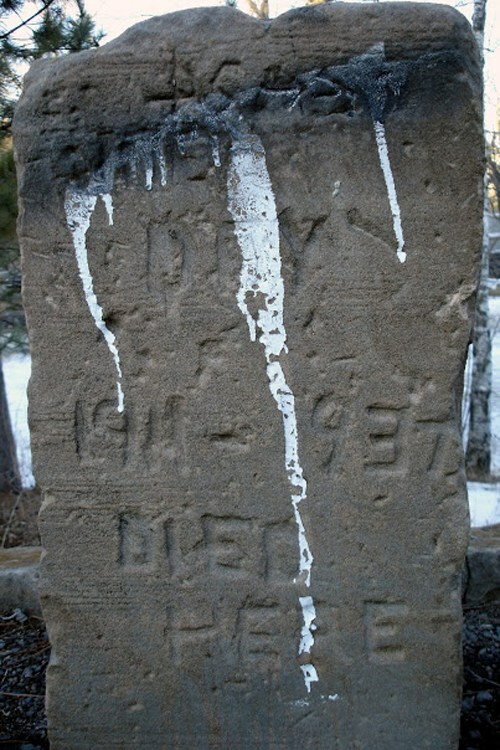 So, about 45 years ago a friend, with hammer and chisel, went to the corner and chiseled the name Joe Day Died Here with the dates seen in the photo. Totally made up but it has generated a little curiosity over the years. Another friend chiseled A. S. in one corner…. And now the mystery is known. So no one died at that spot in Lincoln Park in 1937. Instead, a decades-old landscaping feature that resembled a tombstone was modified as a prank, and remains a feature of Lincoln Park today.